I'm back again. Sorry about the sporadic posting. It's been a bit busy here as I have six weeks left of uni! I can't believe it but at the same time, this semester has been dragging by and I cannot wait to finish. My Dad came down last weekend to run Bridge to Brisbane with me, which coincided with his birthday and Father's Day. It was a great weekend - we ate a lot, I ran my first ever race (only a 5K) and in general enjoyed having some family time. It was great to spend time with just my Dad - usually in my family I hang out with Mum and my brother hangs out with Dad. It was a shame my Mum couldn't make it down this time, but both my parents will be visiting again in three weeks. So today I am back with what can't really be called a recipe, especially because I forgot the precise ingredients I used. Sorry about that. I'm not winning any awards for being a good blogger at the moment. These frozen bananas were, obviously, inspired by Arrested Development, which if you haven't seen, do so (though not season 4, feel free to skip that one). 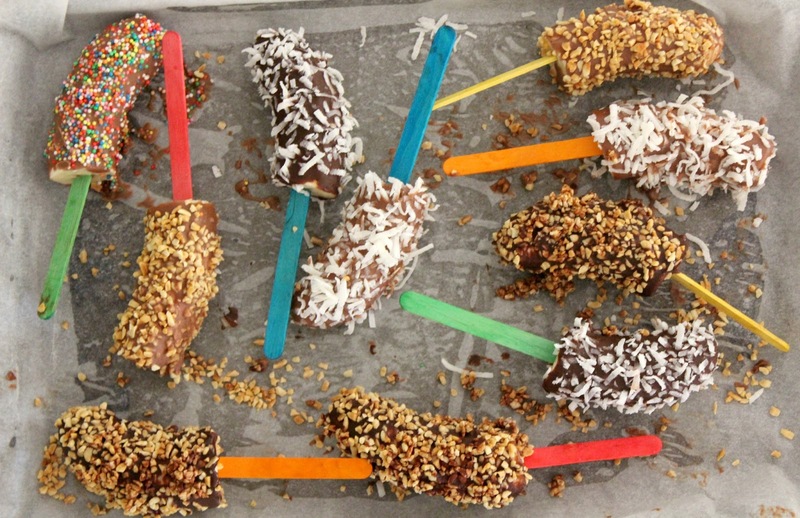 You can pretty much do whatever you want with these - dip the bananas in any kind of chocolate you want (or peanut butter or yoghurt) and roll them in nuts, sprinkles, choc bits, coconut, etc. I also want to thank my lovely friend Annie for making these with me. We actually made these about two months ago but I never got around to posting the recipe on the blog. I thought now would probably be a good time - it's the end of summer in the other half of the world, and over here (on the right side of the world) it's spring and the temperature is pretty much perfect at the moment (mid 20s). So everybody - get busy. Cut the five bananas in half, so you have 10 half-bananas, sliced lengthways in the middle. 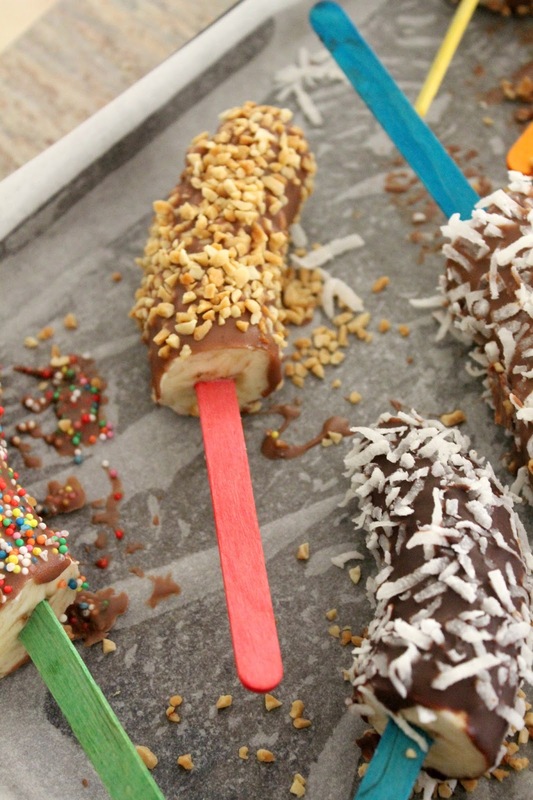 Insert the popsicle sticks in the flat (cut) end of the bananas. Make sure the popsicle sticks are wedged tightly into the banana so the banana will not fall off. Melt the chocolate you are using. While it is melting (do it over the stove so the chocolate melts evenly and stays warmer for longer), lay out desired toppings on a bench near the melted chocolate, so it easy to do the following steps. Place a tray covered with baking paper near the toppings. 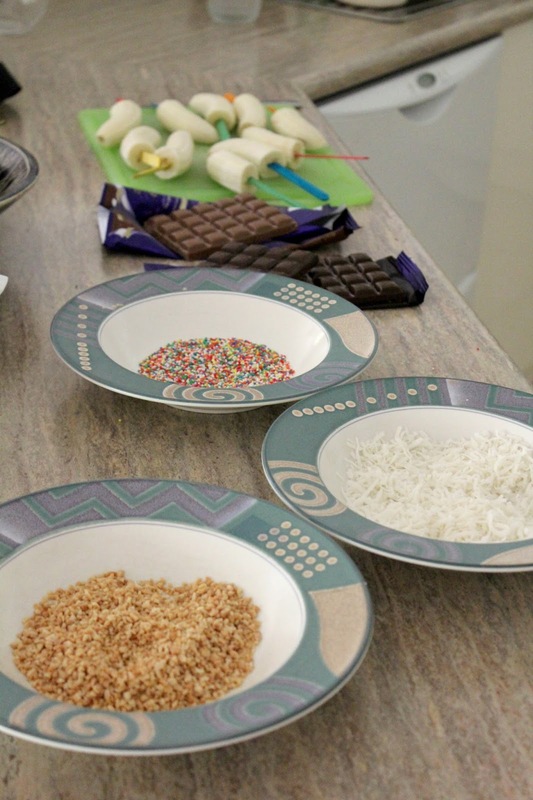 Dip a banana into the melted chocolate and then roll in your desired toppings. Carefully place decorated banana on the tray. Repeat for remaining bananas. 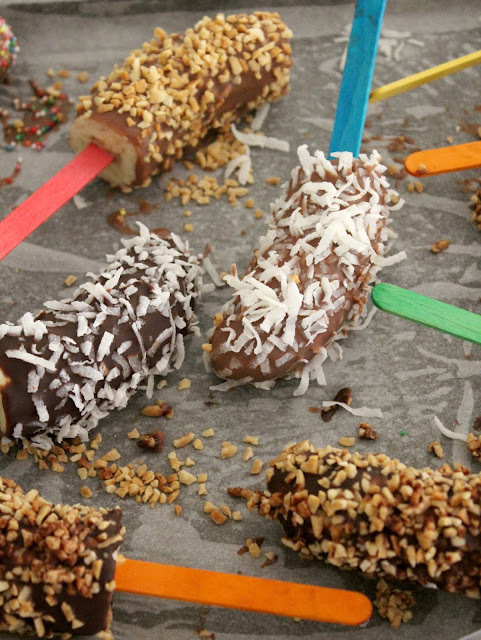 Place tray with decorated bananas into freezer for at least half an hour. Keep bananas frozen and serve cold. well now all I want is a sugar coated banana... like stat! My dad used to buy these from dairy queen..ya no idea they actually sold them back then but it was a big thing. we loved them! These are totally cute. My mom used to get these at the State Fairs when she was younger but I never got to try one. I bet the coconut-topped ones are amazing. 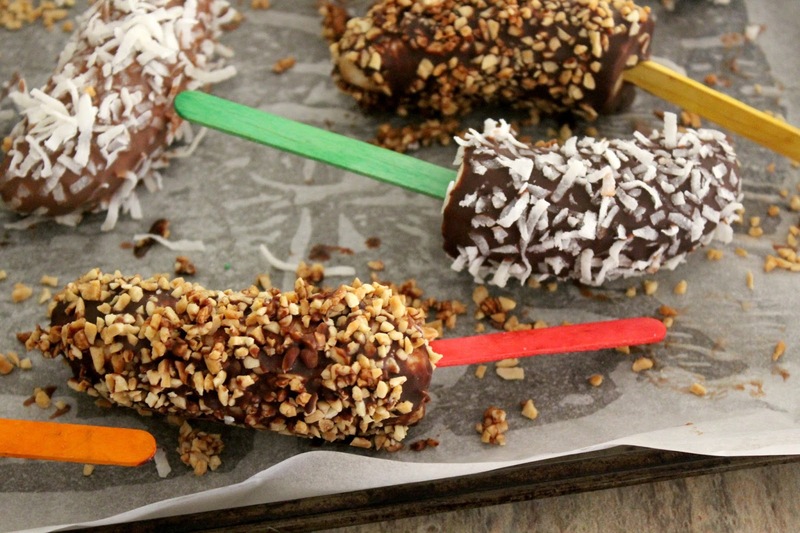 I don't like raw bananas, but I certainly would eat these! They have sprinkles :P! Frozen Bananas looks so delicious and yummy.I loved your way of cooking and dishes. My sister prepared for me. I like it you really deserve this review. Last night I made Punjabi Murgh Pulao Recipe, Its taste also awesome.Sharing a link with you: ( http://howprices.com/punjabi-yakhni-pulao-recipe/ ).